Hello everyone! 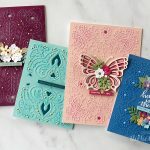 This is Hussena from Quill and Punch Works, sharing my final post as a Guest Blogger this month on the Spellbinders blog. 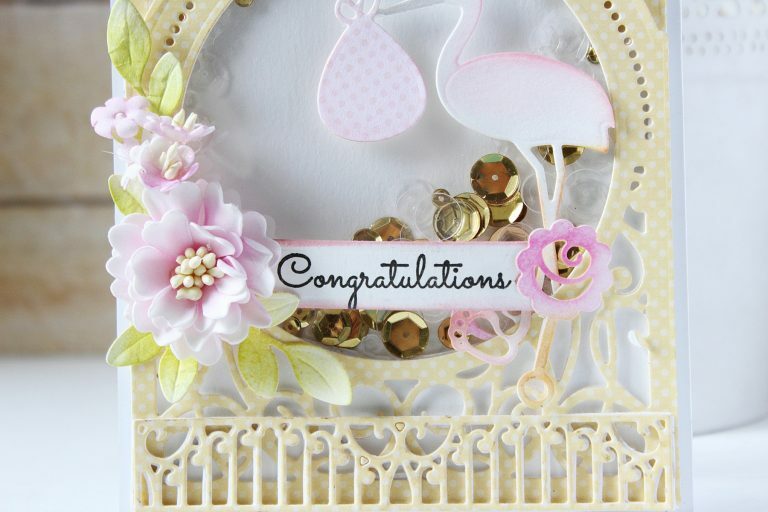 I have had an absolutely amazing time working with the 3D Vignettes Die Collection by Amazing Paper Grace. You can check out my first and second post using these dies on the Spellbinders blog HERE and HERE. 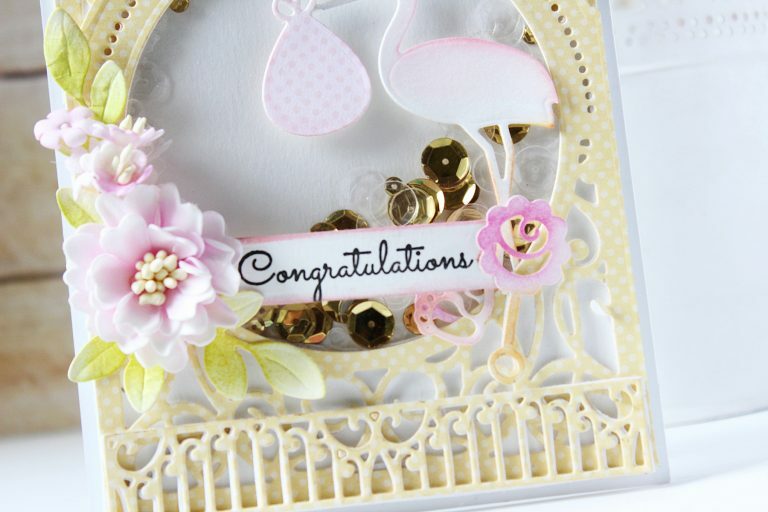 The designs are so gorgeous and versatile, and can be used for all occasions starting from Weddings to Birthdays. Today, I have two cards to share. The first card is an anniversary card, while the second is a baby shaker card. 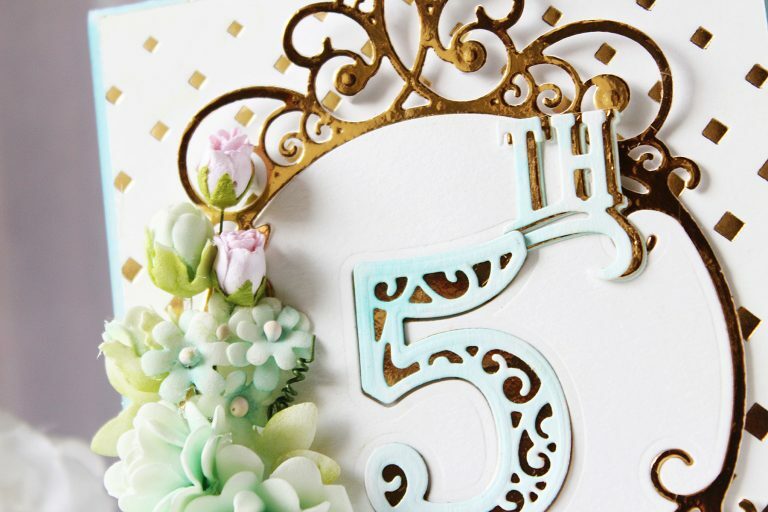 To create this card, I first die cut the Tiara Rondelle dies out of some gold foil cardstock, and backed it over white cardstock to make it sturdy. I then adhered the coordinating inlay piece left over after cutting the frame to the center of my card. 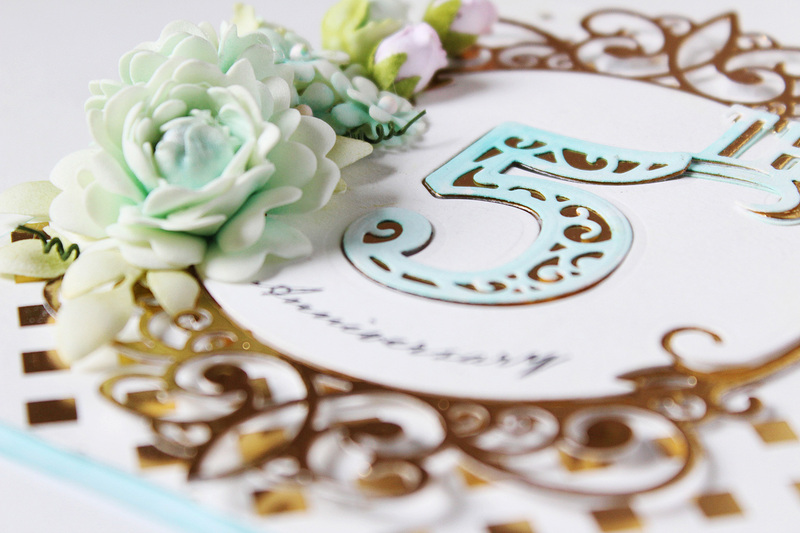 Next, I worked on the sentiment for my card – ‘5th Anniversary”. I die cut the number 5 from the Filigree Numbers dies. They were die cut twice, once from gold foil cardstock, and the second time from some white cardstock, which was later inked to make it a light blue color. The ‘Th” was created in the exact same manner, and is a die from the same set. 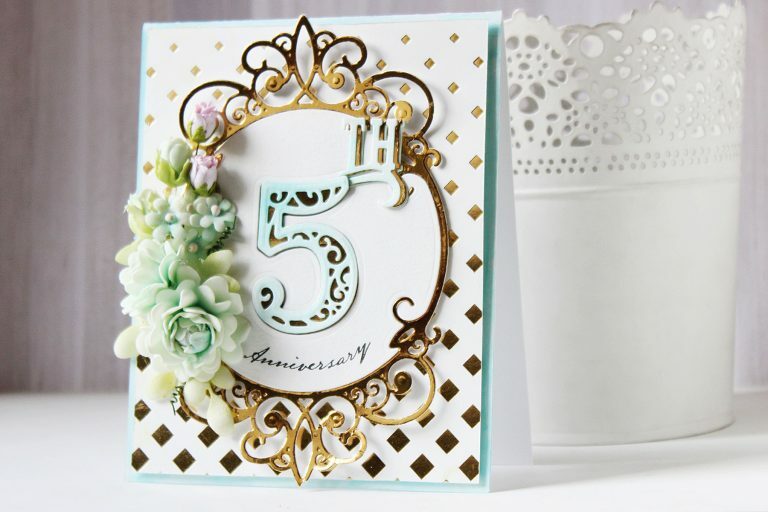 The word anniversary has been stamped using black dye ink, and is from the Giving Occasions stamp set. 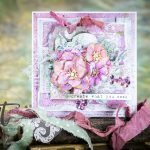 The florals are handmade by me using the Cinch and Go Flowers III dies. 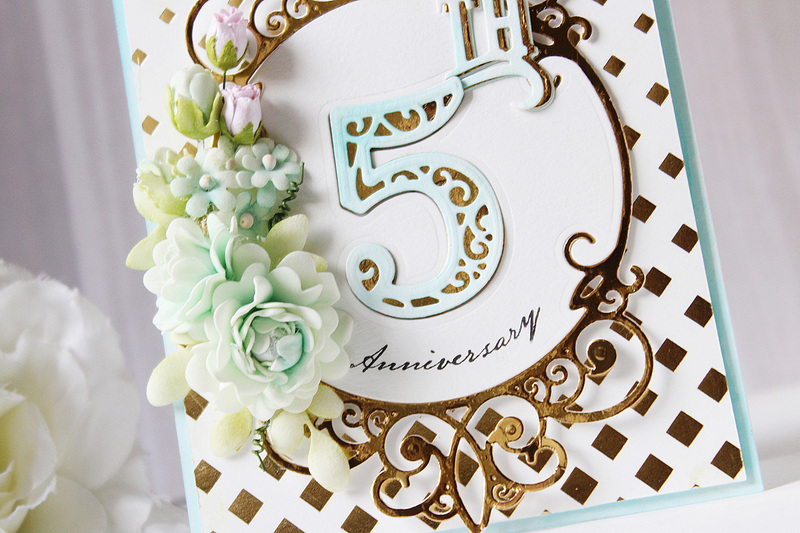 They were cut from White Foamiran sheets, and lightly colored using dye inks to give a soft look. 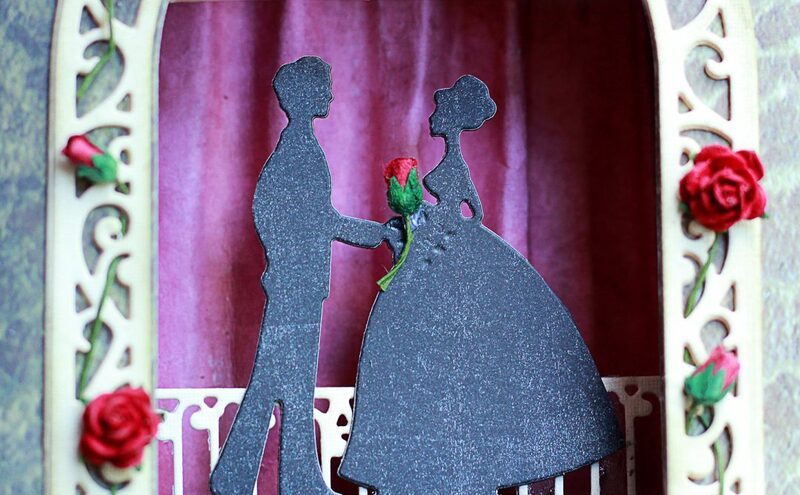 The leaves are from the Cinch and Go Flowers III dies set as well, and were also cut from Foamiran and colored. 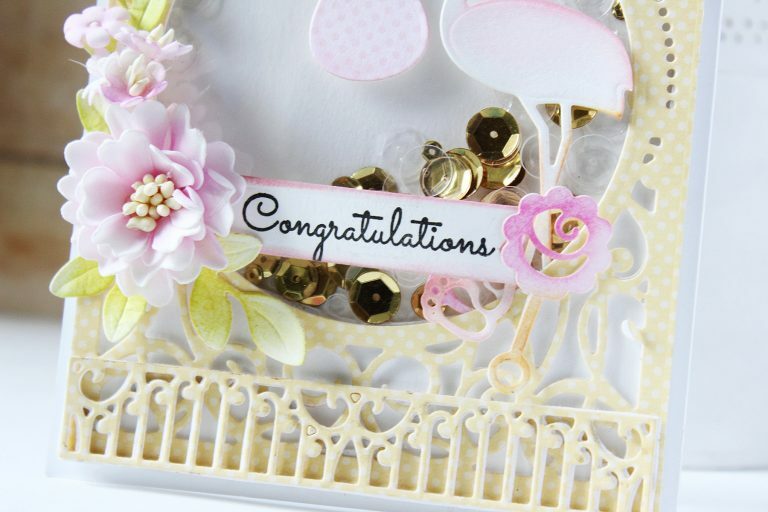 For the small filler flowers, I used the mini flower die from the Petite Double Bow and Flowers die set. They were cut from White Foamiran sheets as well, and then lightly colored. I even made small rose buds using the same die. The dies are very versatile, and you do have a lot of possibilities with each set. Here are some pictures showing you a closer look at the flowers. I adhered the card panel to a light blue colored A2 card base, and my card was done. 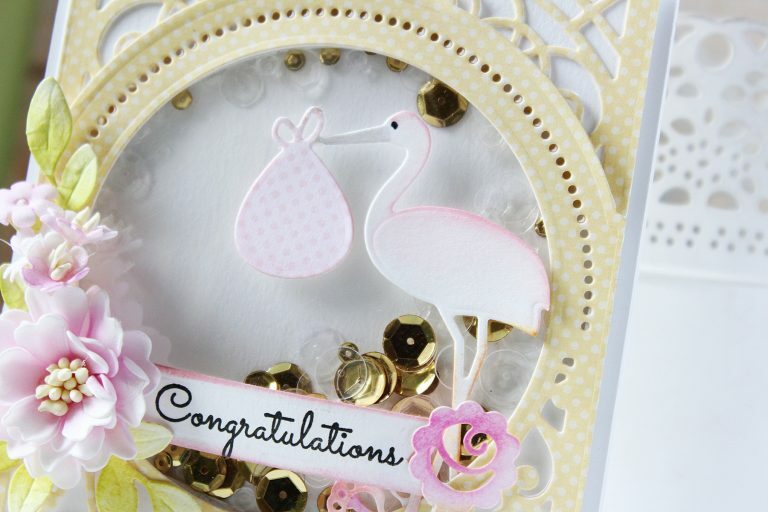 My next card is a baby themed shaker card. 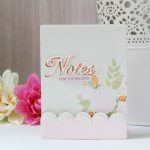 I thought it would be fun to make a shaker card using these dies, and I hope you like the idea too! I started by die cutting the Dome from the Grand Dome 3D Card dies from some yellow polka dots pattern paper. This was layered over the Grand Arch from the Grand Arch 3D Card dies. 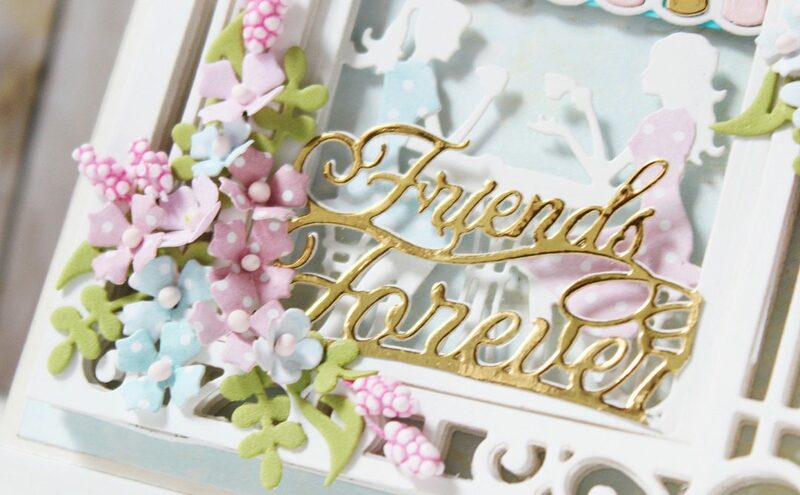 The yellow intricate fence is die cut from fence included in the Ornamental Arch dies. 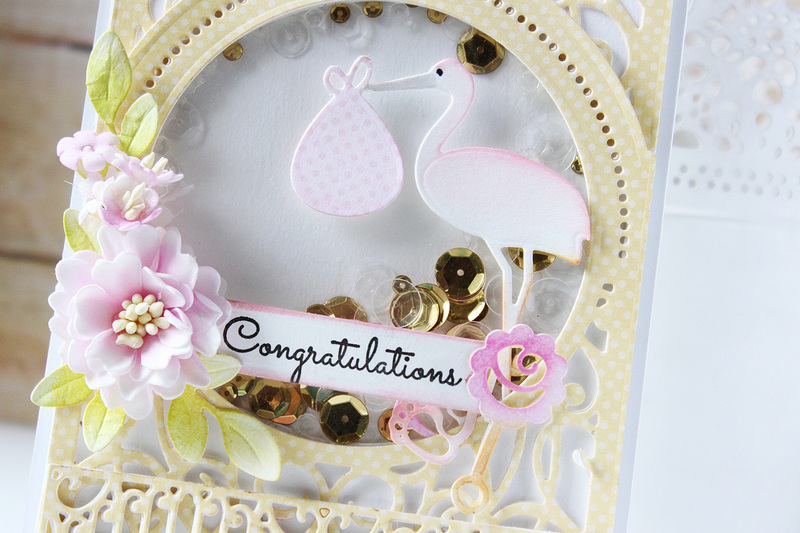 The white stork die cut is from the Bundle of Joy dies. The stork comes with a frame, but I snipped off that frame, so that I could just get the image of the stork and the baby bundle. 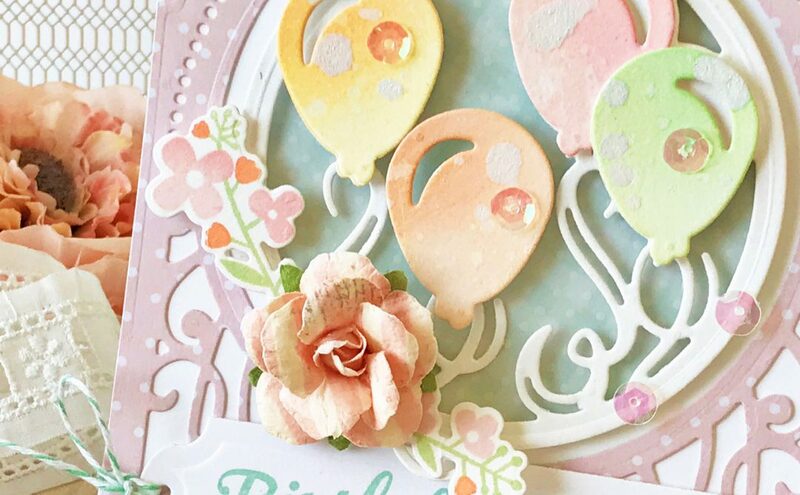 They have been paper pieced with a pink polka dots pattern paper. The rattle and the baby feet are also from the same set, and have been lightly colored using dye inks. 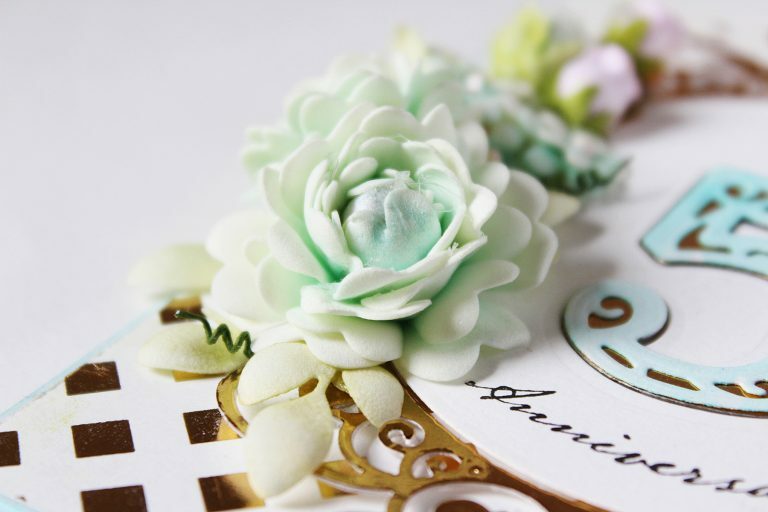 The small flower cluster is again made using the dies from the Cinch and Go Flowers III Dies. 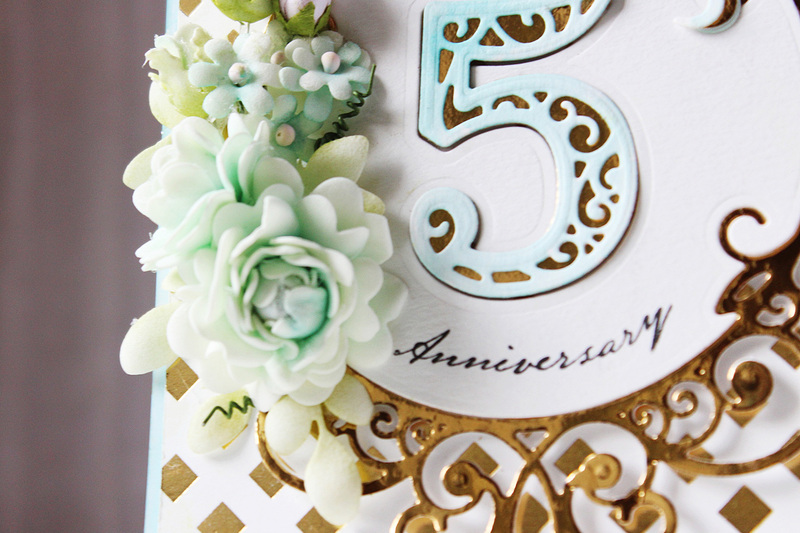 The flowers have been cut from Foamiran sheets and inked using dye inks, while the leaves are cut out of white cardstock and then colored and embossed. The sentiment has been stamped on a strip of white cardstock. I have used the sentiment stamp from the Giving Occasions stamp set to stamp it using black dye ink. I created the shaker using some gold and clear sequins, and my card was done! I hope you like my my cards for today. 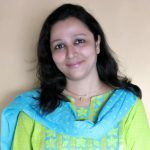 If you have any queries/questions regarding any technique or product used, please feel free to leave a comment below, and I will get back to you. 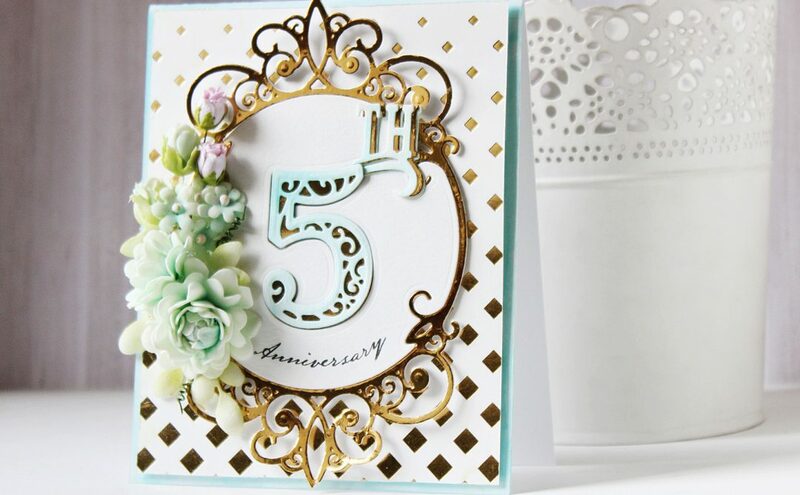 These are so Gorgeous cards !! 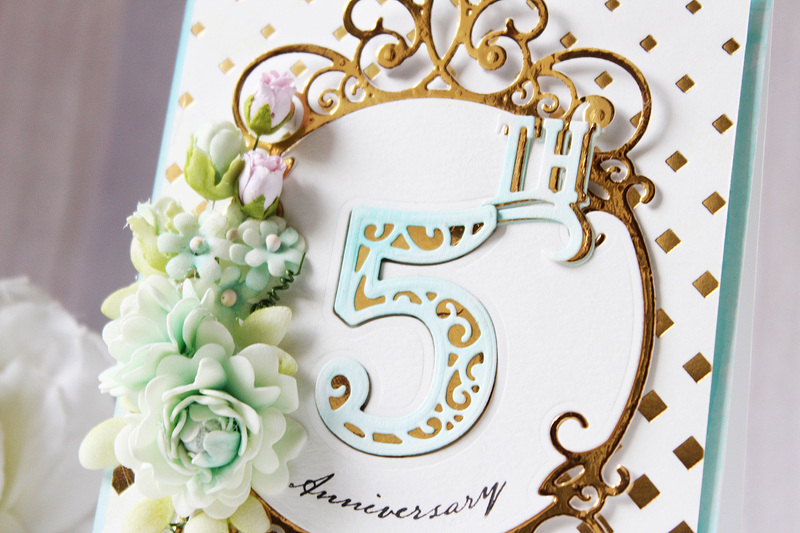 Loved the soft colour scheme beautifully paired with gold foil and intricate dies !